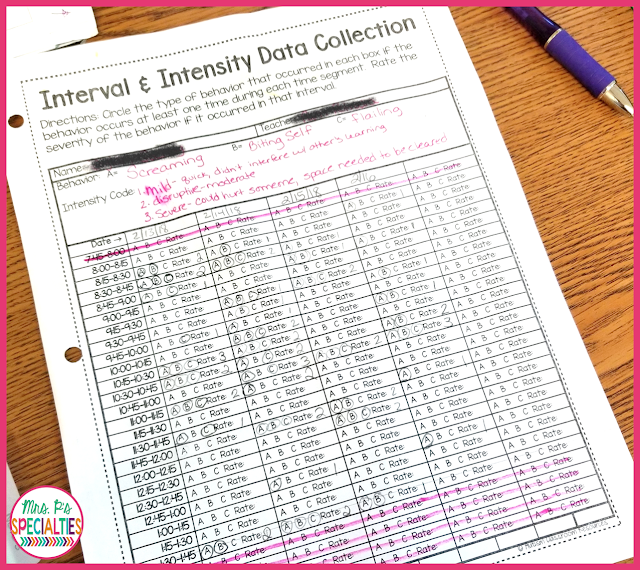 Data Collection: Figuring Out The Details | Mrs. P's Specialties! 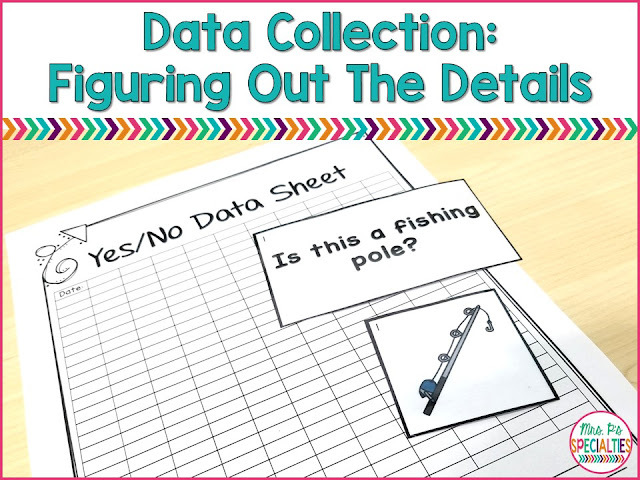 While special education teachers realize how important data collection is, it is one of the areas teachers tell me they struggle with the most. 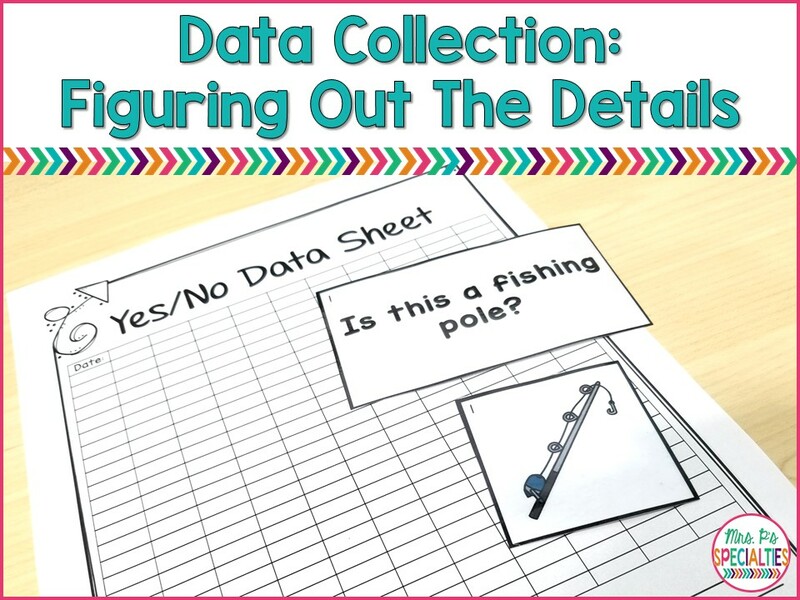 These tips will help you organize, collect and analyze data. You need to know what you are taking data on and why you are taking this data. This will help you choose the correct data form needed. Having the correct data form will make analyzing the data so much easier!! For example, if I am taking data to see if little Joey is initiating communication more than last month I would use a frequency data form. I will easily be able to see how frequently Joey initiated communication and how many times he need a prompt. If I had used an intensity data collection form, I wouldn't have the data I needed to assess initiation skills. When Will You Take Data? Now that you know what type of data you need to collect, it is time to decide when the data will be collected and who will actually take the data. For some goals you will need to take data all day long. For other goals, you should pick times of the day that the student should be using that skill. For example, ABC (antecedent, behavior, consequence) data should be taking all day because you are looking for patterns and function of the behavior. You would not take data all day long if the goal is to attend in groups of 4 or more students. Sometimes, we don't always take the needed time to make sure our staff (paras, therapists, etc.) are fully trained in how to take the data and complete the data sheet. BUT, we need to! Choose the few types of data sheets that you use the most and schedule a time to teach staff how to do it. I like to do this as a group because questions will come up and it is easier to answer them when everyone can hear the answers. 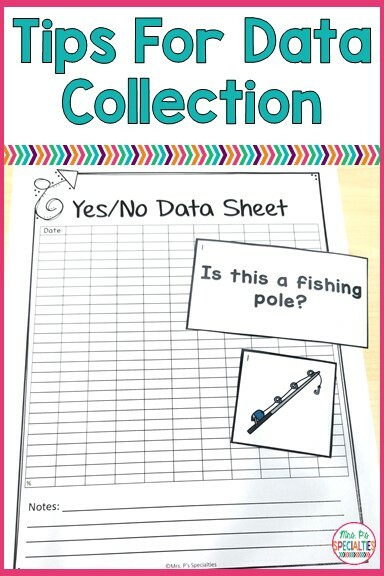 Once you have trained staff on particular data collection sheets, use them whenever possible. Sticking with data collection sheets that staff have already been trained in will lead to more consistent data that is accurate and easier to analyze. Once you have chosen the correct data sheet, trained staff on it and have decided on the times to collect data, it is time to actually collect the data. In my classroom, I put the data sheet on a clipboard with a pencil attached. This makes it easy to write on the sheet in any situation and makes the sheet easily transported throughout the school day. At the end of the first day of data collection, try to touch base with anyone who was involved in collecting the data. It is important to answer questions, problem solve, etc. Here is an example of one of my favorite data sheets (from Autism Classroom Resources). Even though I had trained my staff, they still had some questions at the end of the day. This also alerts me to inconsistencies in tracking the data that day. Even with all of this planning, you may still run into trouble. I find this to be especially true when collecting language data. For example, at times we have to collect data on how many times a student made a request. I was finding that numbers greatly varied between paras, so I scheduled a time to observe the paras while they were collecting data. I realized that not everyone had the same definition of what constituted a verbal request. I had given examples during training and thought it was pretty straight forwards... Nope! You may need to be clever in solutions to data collection problems. In the example above, I made a video of me and another person to practice counting verbal requests. I simply recorded a 2 minute role playing scenario on the class iPad and found 15 minutes to watch it as a group and count. That 15 minutes was so fruitful! It revealed so much about how staff was thinking about and doing the collection. Again, whenever possible, have these conversations in a group setting to save you from repeating yourself over and over.